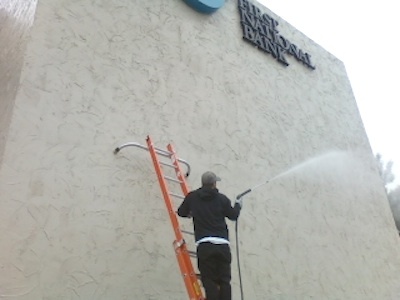 Commercial power washing is a division of CoMo Power Wash that has helped to increase our business. In our commercial power washing division, we offer a variety of services like gum removal, business cleaning, commercial cleanout, interior painting, office cleanup, oil cleanup, and commercial pressure washing which includes garage power washing. For both large and small businesses, these are valuable services. Our skilled pressure washing team tackles large and small parking garage structures. We can thoroughly clean commercial buildings with exteriors made of brick, block, vinyl or aluminum siding, stucco, wood, or composite materials. CoMo Power Wash has successfully pressure washed exteriors made of concrete, tile, stone, metal, asphalt, and other building materials. Our cleaning solutions are environmentally friendly and economical. We use state-of-the-art equipment that lifts and removes discoloration and contaminants from all types of surfaces. Using effective cleaning solutions and pressure washing, we can remove stubborn stains, mold, and mildew from the surface of your building. With proper maintenance, this process can prevent the growth of contaminants that cause discoloration and staining. If you are thinking about selling your business property, pressure washing is a good way to prepare the building for future sale. A fresh appearance will improve the exterior and make it appealing to prospective buyers. We offer same day and next day power washing service. Our satisfaction guarantee assures that you will receive the best value for your investment. Call us today. We offer quick reliable service with skilled professional technicians and free written estimates.